The application and adornment of metal ornamentation on book bindings has long been a method used to make books more opulent. Gold tooling first was used in Persia as early as 1339, and it first appeared in England in 1519. Colonists brought the trade with them to America. Prominent Boston bookbinders Edmund Ranger and John Ratcliffe – and probably others – decorated their bindings with gold tooling in the 17th century. The use of gold on American book bindings became more widespread after the Revolutionary War. Gold ornamentation also became progressively more ornate. Prior to the 1830s, binders applied gold decoration by hand. The process included making a blind impression in leather, brushing an adhesive egg-white glair into the impression, applying gold leaf with heat, and wiping off the excess. Developments in the early 19th century inspired some modification, but the process remains essentially the same to this day. As railroads spread across the country and the public enjoyed more leisure time and expendable income, books became a popular commodity among American households. Cloth bindings were a more affordable alternative to the leather bindings that had been used for centuries. However, these first cloth bindings would not hold impressions or gold leaf. In 1832, special cloth became available that binders could use in the same way they had used leather. At the same time, a mechanical press was developed that enabled binders to apply greater force than they could by hand and allowed them to easily replicate the same design on multiple copies of a single title. American manufacturers produced such presses by 1838. Gold stamping thus became the choice technique for decoration due to efficiency and ease. The practice also was an ideal marketing tool for publishers and binders alike, adding to mass-produced books a touch of luxury and an element of beauty. The designs changed with the times and trends. 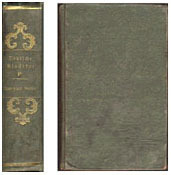 The decoration used in the 1820s and 1830s was very simple, usually consisting only of the book’s title stamped on the spine. At mid-century, when gold was more readily available and publishers’ bindings became more popular, the gold-stamped designs often were rich and elaborate. In the decades to follow, binders began to use gold mainly as a complement to other methods of binding decoration, such as black and color stamping and printing. In the 1880s and 1890s, the popularity of ‘silver’ stamping grew. Silver leaf had been used in tooling as early as the 15th century, but binders found that pure silver eventually would tarnish to black. Binders abandoned silver stamping altogether in the 1850s. However, by the 1880s, the look of silver stamping could be achieved by using a mixture of palladium and aluminum, which would not tarnish. Stamping with such substitute materials – called white metal stamping – became common. The 1890s also saw the increased use of gold foil, a brass-gold alloy that binders found to be more economical than pure gold leaf while still providing an opulent look. Toward the turn of the century, cloth bindings started to fall out of fashion in favor of paper bindings and printed dust jackets. However, the spectacular gold-stamped bindings of the late 19th and early 20th centuries are clear evidence that, at least for some, the art of gold stamping did not lose its luster. Allen, Sue and Charles Gullans. Decorated Cloth in America. Los Angeles: UCLA Center for 17th- and 18th-Century Studies, 1994. “Decorative Publisher’s Bindings: Ohio Imprints and Authors.” Cleveland Public Library. Diehl, Edith. Bookbinding: Its Background and Technique. New York: Dover, 1980. Bindings.” University of Virginia. www.virginia.edu/oldbooks/exhibitions/eureka.pdf. Gaskell, Philip. A New Introduction to Bibliography. New Castle, DE: Oak Knoll Press, 1995. Collectors & Librarians. New Castle, DE : Oak Knoll Press, 2002. Lehmann-Haupt, Hellmut, ed. Bookbinding in America. Portland, ME: Southworth-Anthoensen, 1941. “Library displays book covers in ‘Gleaming Gold, Shining Silver.’” Yale University.